Our company has been established for fifteen years. We support John of God and are volunteers at the Casa de Dom Inacio. We offer flexibility in transportation to and from the airports and for weekend leisure travel. Our experienced drivers will take care of getting you to your destination while you relax or hold a group meeting. Available for groups as small as 4 people and as large as 40 or more. We are based at Pousada Catarinense if you would like to come by in person and discuss your weekend travel needs. All our vehicles are new and fully insured. 12 or 15 Passenger Van - Our Vans Seat 12 or 15 people. 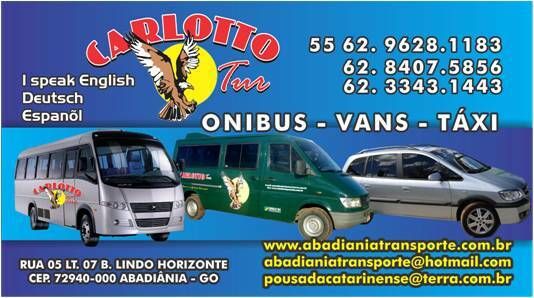 Available for group airport pick ups as well as for weekend tours to see the local attractions. Car Service - Our car will seat upto 4 adult passengers. 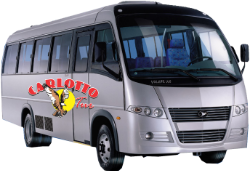 28 Passenger Bus - For the larger groups we offer a min bus that seats 28 passengers. PLease fill in the reservation form and we will respond with a cost estimate based on the number of passengers you have.